Overview: The old comical antics of court jesters in regal settings is the theme of Jolly Jester. 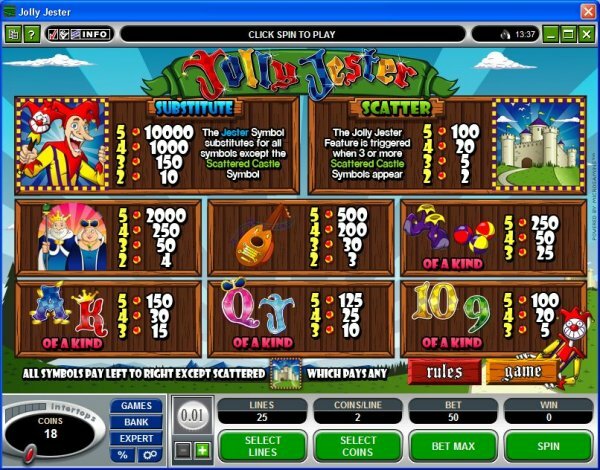 This 5 reel, 25 pay-line giant of a slot charms the player with its comical and jovial nature, placing the player in medieval times in the King and Queen's castle where they not only enjoy the Court Jester's amusing antics, but are rewarded along the way. Medieval style cartoon with clean pastel graphics provide the stage, with the comical jester, castles and royalty all setting the scene as the player laugh's their way to reward. 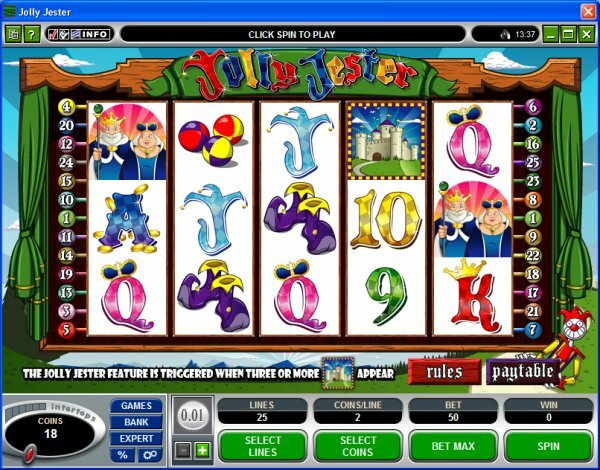 The principal roles here are held by the Jolly Jester, who is Wild and therefore substitutes for most other symbols to enable the player to create winning combinations and the beautiful Castle in which he lives gives a chance at the Jolly Jester Feature and free spins. 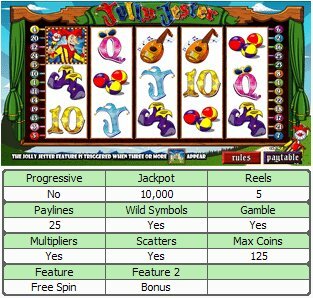 Similar Slots: If you like Jolly Jester, you might like these other 5-reel slot machines: Big Kahuna : Snakes and Ladders, Break da Bank Again, Franken Cash, Gypsy Queen, Rainbows End, Tiger's Eye.